Set in the Northern part of the resort this brand new hotel is ideally located near the beach and the lively main promenade. 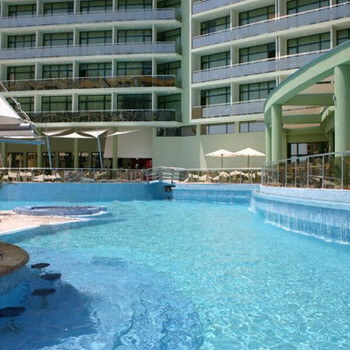 The hotel Marvel boasts a wide range of on-site facilities including a impressive outdoor and indoor swimming pool. Was told by Thomson that there was entertainment every night!! There was none, as we went all inclusive we still wasn't allowed to get free drinks from the only inside bar and had to que outside in the wind and rain from the outside bar, if you wanted a tea or coffee you got half a cup and you got it in a plastic cup, not ideal, there was nothing to do in that hotel, even though there was a spa and an indoor pool you had to pay for it, staff wore their outside jackets while taking away your plates etc in dining room and never spoke to you at all, really rude, cleaner swept floor while you were eating, our room was never cleaned just duvet folded in half even though the corners of my sheet had came off my mattress, the place was a disgrace, wouldn't recommend it at all. Hotel tip: Seemingly one of the best restaurants was the steakhouse next door to the Marvel, which closed up for the end of season two days after we arrived so didn't get to try it, top tip for the Marvel would be to put their staff on a course to learn how to be polite and engage with holiday makers, at the end of the day it's us who pay their wages!!! They just didn't care. Large room. Cleaned daily clean towels daily . Short supply of sunbeds but not to long to wait. Cleaners all day every day everywhere within the hotel and grounds very clean. nice to sit outside at meal times on the outside terrace overlooking the pool very nice relaxed holiday .we did take out own kettle and tea bags for our room as we checked with Thomas Cook before whom informed us no kettles in the rooms. Hotel tip: We went all inclusive .we found beer half litre glass 1.50 lev what is around 40p at lots of bars we also ate out a lot because the food was so cheap , food at hotel was good also microwave if u want to have your food red hot . Hotel was clean and rooms spacious, bathroom was a decent size. Great view of the pool from hotel balcony. Most hotel staff were friendly and helpful. Food was ok but we ate out most the time as the food was cheap enough. Couldn't always get a sun lounger around the pool side. Cocktail bar does really nice cocktails. Had entertainment for children. Hotel on the main strip and around a 5 min walk to the beach. Hotel was lovely! Rooms were very spacious and clean. Only downside was the food. Ate out most nights as couldnt face eating in the hotel restaurant! Breakfast wasnt much better! Def recommend taking your own tea bags with you!!! I stayed at the marvel hotel from 12th sept - 20th sept, I advise to anybody going to sunny beach that if you are thinking of staying in the marvel hotel to think again, but if you do decide to go to hotel then stay self catering as 7 out of the 8 people I met in the hotel suffered from bad stomachs and vomiting and 2 of those 8 were actually diagnosed with food poisoning by the hotel doctor. I and my partner only ate at the hotel twice because the food is really poor. We stayed in the Marvel hotel for a week at the end of August.The location is excellent, just a hundred yards from the beach.The hotel and rooms are very clean.The breakfast is horrible in the hotel,if you are looking for an Irish style breakfast forget it.One of the reasons I picked this hotel,was for the Air conditioning it "Advertised".The setting was between 24deg c and 26deg c and it would not go lower and there seemed to be no air being pumped out of the unit.I asked at the hotel reception could the lower it to say 18 deg c and they told me they could not as it was centrally controlled. Sunny beach is excellent and Inexpensive.There seemed to be no draught Heiniken,Budweiser or Carlsberg though although you can buy bottles at around 2 euro each.The local beer is cheap at around 1.50 euro a pint. The hotel was kept clean, and the cleaning staff very friendly. The pool side was small and into our second week we found it hard to get sun beds, they are also very packed together. The food was terrible, it looked very nice but it was horrid. My boyfriend was served raw meat by the main cook and b time he got to our table his plate was swimming with blood. Every day was the same and we ended up sticking to having just chips. our room was situated over a bar with every night mon-sun people singing and shouting which was ment to end at 12, but never did one night it carried on till 2 in the morning, while they moved chairs scraping then over the floor (this was the staff). we complained and got moved to another room which was facing a building site and the maids never really came after that, and when they did they spilled water all over my make-up. Other than the horrid singing i never saw any other entertainment in the hotel. We went on this holiday as a late deal though travel republic. The hotel was extremely clean and was constantly cleaned throughout the day. The rooms were cleaned each day and clean towels provided although on one occassion no bath towels were provided and we had to ask at reception for these. there was no entertainment provided oh tell alie adfvertised was kareoke at 9pm each evening - dont know if it ever happened as we went out each evening!! The pool area was fine and clean too - no problem getting a sun bed although we did find out that we were there at the end of the season!! This also is the coldest pool ever - ice in fact takes 20 minutes of coaxing yourself to get in!! We would visit this hotel again as a base but would like to see something going on in the hotel!! The Marvel Hotel, one word WOW this hotel is kept so clean, way above any expectations i had. All teh staff were very friendly, I rated the entertainment as None, because we went out everynight. The day after we went to reception to get passports back as we needed the for cashing in some cheques. They were handed back no problem. The safety deposit box is located in the lobby and its 5lev per day, this required a member of staff to open as it needs 2 keys. We always found it easy to get passports when we wanetd , never waiting around. The exchange rate in the hotel was 2.60 but we were able to get 2.78 at Crown exchange. Upon going to evening meal, as you enter the restraunt one of the many pretty girls will ask you for your room number, then your free to serve yourself at the buffet style counter. They havny got the hand of english sausage yet as its still hot dogs, but theyre getting there :) The food varied from day to day, but we were always able to get Pizza if we wanted it. Normally the hotel has a special on the end, this ranged from, Liver and onions to Fish to stirfried veggies. This is cooked fresh infront of you. Brekfast was good, with Fried Eggs, Fresh bread, Baked Beans(Heinz somedays) stay away from the fried bread and the sausage though as theyre not nice. I'd definitly go back to this hotel, without a doubt I'd be there tomorrow if I could. I've just got back from the Marvel in Sunny Beach and had a great time! The hotel was constantly being cleaned and was lovely! The only issues we had with hotel were that to get in the safety deposit box, a member of the front desk/security had to open the box for you. This was a pain as the boxes were kept in the lobby and you had to find someone to open it, who then had to find another key (as it was their key and yours that opened the box up). We found some of the male front lobby staff to be very rude and on the last day, even through we paid for food, we ate out to keep away from them. Another issue was the poor amount of lifts. there were 10 floors, one lift went up as far as floor 10, but the others only went to 7. As we were on floor 8 it took so long to get a lift!!! Rooms were lovely and cleaned daily, we had a lovely view and could see the sea. There isn't much for young children.